As part of the ICT PLT, Kim has been experimenting with OneNote as an organiser and lesson delivery tool. OneNote is so effective that many schools have integrated it into their classes at an institution level. A well put together OneNote document can act as your term planner, lesson plans, a container for associated resources and a workbook and revision tool for your students (wow!). How is it different from a word document? A OneNote notebook is never meant to be printed out, it is a multimedia document and, as a result, it has more functionality when it comes to inserting different types of information from videos to links to images. 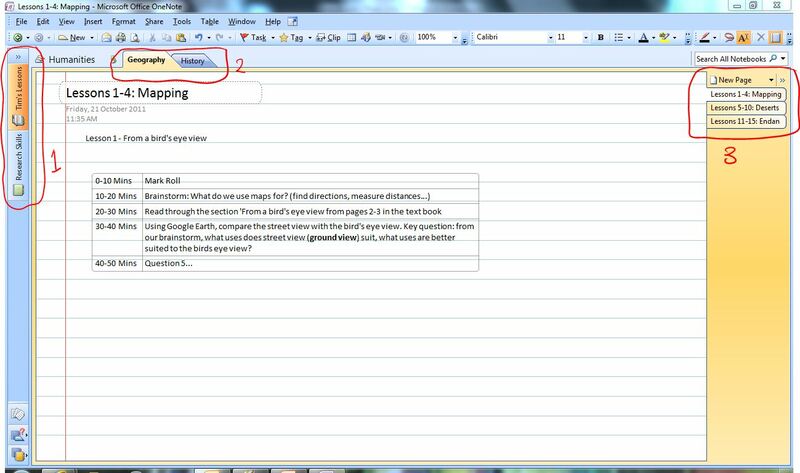 It has great features when it comes to annotating a research session on the internet allowing screen captures that include the time, date and place of where they come from. It also embeds most things rather than linking to them so, even though the file sizes are huge, your notebook contains all the things that you need in it and these will go with it when you transfer the file from PC to PC. The other great thing about OneNote is its organisation (pictured). Notebooks (1) are divided up into Sections (2) which contain Pages (3). This allows you to put all of your Humanities subjects into the one notebook, give each subject its own section (History and Geography) and divide the subjects into topics or individual lessons by giving them their own page. How will I find it again? OneNote is constantly saving the notebook that you are working on and, because of the organisational features listed above, you will only have one OneNote on your computer that is divided into all the sections you need. This means an end to searching for different Word documents saved all over the place*. * But if you have Word documents saved all over the place, putting links to them from your notebook will make them easier to find. This entry was posted in OneNote, PLT. Bookmark the permalink.